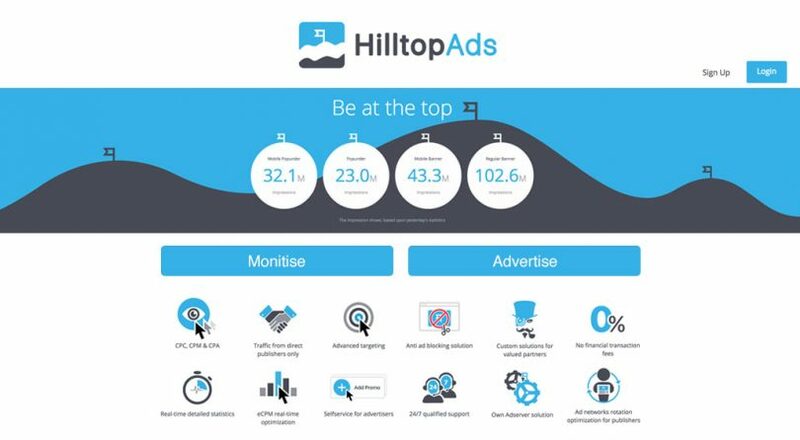 HilltopAds is a global advertising network that helps facilitate a mutually profitable and satisfying relationship between advertisers and publishers by serving ads to monetize websites using cutting edge smart tech solutions on their advertising platform. With an average global monthly impression of about 12 billion, HilltopAds has become one of the leading ad networks in terms of website traffic monetization. Most advertisers frequently worry about ROI while publishers simply want to monetize their websites in a safe and efficient way. With HilltopAds, this seemingly herculean task has been made quite simple especially because they provide their own ad server solution for website traffic monetization, as well as an efficient and advanced self service platform for advertising campaigns. However, one of the best features of HilltopAds is their ad rotation of eCPM’s in real time. Also, publishers can earn an extra income by participating in the network’s referral program, where 5% is paid for every client referred. Another great feature of HilltopAds is their anti ad blocking solution. This is particularly great news for both publishers and advertisers. HilltopAds is especially perfect for beginner webmasters with no prior experience in website monetization because there is no restriction on websites. Almost all websites such as micro sites, entertainment sites, gaming sites, blogs, news, etc, are accepted. Also, with a clean and intuitive dashboard, publishers are sure to enjoy a maximally enhanced user experience with HilltopAds. 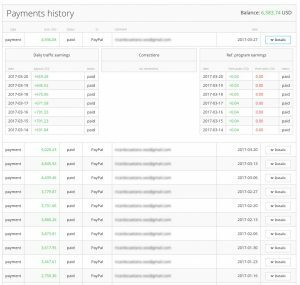 No transaction fees for payouts! Ad Formats: Mobile and Desktop pop-ups, Display banners, in-Video ads. Publisher Reporting And Admin Control Panel. The HilltopAds dashboard is very intuitive with a clean design. It is user friendly and makes for easy management of your account, ads and transfer of finances. It is important that you are well aware of all options available to you in the dashboard so that you can fully maximize your revenues. The Reporting section is very informative and easy to use as it gives real time statistics for both publishers and advertisers. Payment Methods Available: PayPal, Wire, Paxum, e-Payservice, Webmoney, ePayments, Bitcoin. HilltopAds is perhaps one of the most publisher-friendly ad networks we have reviewed in recent times. They are a global ad network with a commitment to enhancing online business growth for both advertisers and publishers. Choosing the right ad network can be a pretty tough chore for a publisher. First you want a network that isn’t only known for integrity but also, one that is user friendly and will help you earn the most revenue from your website. HilltopAds demonstrates all these qualities and much more. As quite a number of networks continue to lose popularity among publishers because of their stringent mode of operation, HilltopAds comes as a breath of fresh air to many publishers especially because of their flexibility and high performance. A great example is the fact that they accept all types and sizes of websites from publishers. This has been a huge burden for many publishers who are usually not given consideration on many other popular ad networks. This is not an issue with HilltopAds. Many networks are also very notorious for requesting for very exorbitant transaction fees or in some cases, being very late with publisher payments or sometimes not even paying publishers at all. Also, transferring money into your personal account after being paid could be a challenge. All these and so much more have been put into consideration by HilltopAds because not only do they pay on time, they require no transaction fees with a minimum threshold of $50 unlike other popular networks who will not pay you until you have earned at least $100. This could be very frustrating especially if you need to make use of your money as soon as possible. Also there is a wide range of payment options ranging from bitcoin to wire transfers to PayPal. It is highly unlikely not to find at least one option that works perfectly for you. HilltopAds is also very impressive when it comes to the use of technology. With an intuitive and clean user interface and a personal manager available, you don’t have to worry about user ability or proficiency in managing your account. It’s all been made very easy for you. It does seem as though HilltopAds prioritizes the needs of publishers and advertisers even over their own as they can be seen to be going the extra mile to ensure that user experience is fully maximized and enjoyed. One of the most interesting things about HilltopAds is that they provide their own ad server solution for website traffic monetization for publishers as well as a highly efficient and advanced self service platform for advertisers.Their anti ad blocking solution is especially great news for publishers because all impressions can be maximally monetized. If you are an advertiser, your biggest headache is probably maximizing your ROI and this is understandable. You want to get very good value for every cent you put into your advertising campaign. HilltopAds has got you covered in this area as well. In fact, by far the best feature of HilltopAds is their ad network rotation of eCPM’s in real-time. This increases the visibility of your best ads with the best payouts by displaying them on the top of your website. Also, the use of keyword targeting, re-targeting and integration of mobile tracking devices enables you to get more clicks and views for your ads. You can also generate extra income with HilltopAds by participating in the HilltopAds Referral Program where you get a 5% cut for every partner you refer. It is without a doubt that HilltopAds is a highly-rated ad network for both publishers and advertisers. For publishers, the benefits are quite enormous as income generation and website traffic monetization are made extremely easy. For advertisers, it is definitely the go-to ad network to get millions of clicks and views for your business. This HilltopAds review is a great example of genuine reviews MonetizePros publishes on many other ad networks around the world to build transparency for publishers. If you work with an ad network and would like to be reviewed, you can find out more about our Ad Network Marketing Plan.